The reality, of course, is a bit muddier. “The agreement is a clear articulation of the fact that almost all countries of the world now agree that climate change is a serious problem—and more serious than they agreed to in the past,” says Jonathan Overpeck, co-director for the University of Arizona’s Institute of the Environment and professor in the university’s Geosciences and Atmospheric Sciences departments. 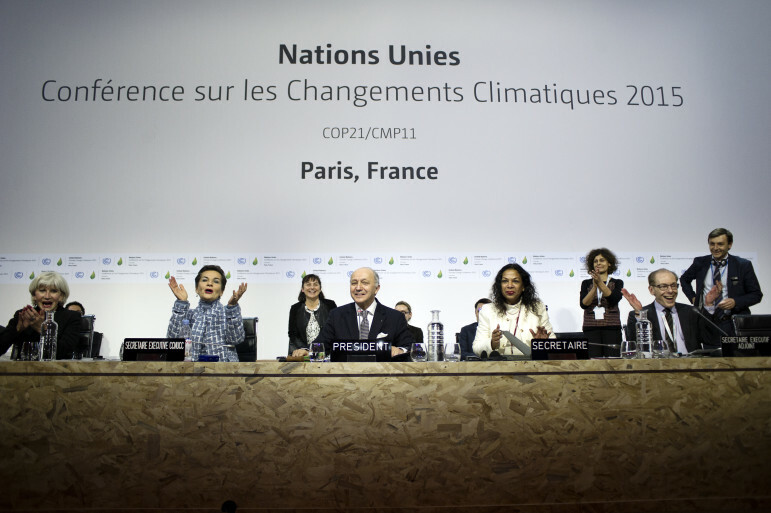 Countries sent their delegates to Paris with pledges and plans to cut greenhouse gas emissions. But the agreement lacks any enforcement mechanisms. Pledges are voluntary and there are no penalties for not reducing emissions. For those who haven’t been riveted to international climate negotiations over the past twenty years, some quick background is probably necessary. Since 1995, the United Nations Conference of the Parties has met in cities around the world to hammer out agreements over what to do about climate change. Broadly speaking, progress has been slow. In 1997, parties did sign the Kyoto Protocol, which set international, binding greenhouse gas emissions reductions. But the United States never ratified that agreement and many countries did not achieve their goals. In Cancún in 2010, delegates followed up on progress made during the previous year’s meeting in Copenhagen, agreeing that warming should be limited to less than two degrees Celsius (3.6 degrees Fahrenheit) above pre-industrial levels. Since then, warming has continued, the scientific community has become increasingly concerned, and the impacts of climate change have become more widespread. Everyone from Pope Francis to grassroots activists—not to mention industry executives—wondered what would happen in Paris. Last week, delegates recognized that trying to restrict warming to two degrees will not protect many countries, especially island and coastal nations that are being inundated by sea level rises. Instead, it now seems imperative to limit global warming to 1.5 degrees Celsius above pre-Industrial levels. That’s going to be pretty tricky. Not only because the agreement lacks binding emissions reductions, but because the voluntary pledges still wouldn’t reduce emissions enough to limit warming to even 2 degrees. In addition, the UK’s Met Office has announced that the Earth’s global average temperature is poised to reach one degree Celsius above pre-industrial levels. The question is, then: Can humans really limit the temperature rise to two degrees, nevermind 1.5 degrees? Overpeck says most scientists think that’s still achievable. The technology exists, he says. The question is whether there’s political will, on the part of the United States and nations across the world. For New Mexicans, the conversation isn’t an abstract one. While the focus lately has been on California, Overpeck points out that the larger Southwest has been in drought for more than a decade. “This drought has been moving around the Southwest since 1999,” he says. “And this drought is unique: it’s the worst drought we’ve seen in the rain gauge record, and it’s made worse because it’s a ‘hot drought.’” That is, the drought is driven as much by anomalously hot temperatures as by precipitation. 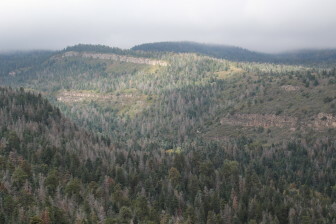 There are thousands of acres of dead conifers in Central New Mexico\’s Sandia Mountains. Warmer temperatures will also affect people’s health, thanks to things like longer heat waves in the summer and an increase in dust storms. And while science is his specialty, Overpeck allows himself to step into the political realm. Although the number of Americans denying or ignoring climate change has become increasingly small, they still have a great deal of influence on policy, which affects people across the globe, he says. “That ranges to people on islands in the Pacific who will be flooded, who will lose their whole country, to people in semi-arid regions, where ‘hot drought’ could lead to all sorts of societal stress and mass migration,” he says. Scientists can describe intensifying wildfires, droughts, disappearing glaciers, the extinction of species and rising sea levels. They can predict and model. But data points and scientific graphs don’t inspire people to change their behavior. That takes faith, says Lutheran lay theologian Larry Rasmussen. And love. Citing Pope Francis’ encyclical ‘On Care for Our Common Home,’ Rasmussen believes action within religious organizations is finally reaching critical mass.